Heavy Metal Detoxification just got a lot easier. AIM, a trusted distributor of quality health and whole food supplements for nearly 30 years has just released a new product to deal with heavy metal detox. 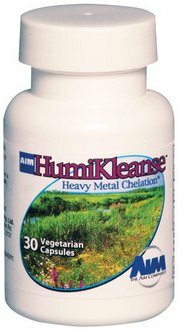 AIM welcomes back a heavy metal detoxification (by chelation) product, AIM HumiKleanseTM, in response to Members asking for a way to deal with the potential ravages of lead, mercury, and cadmium, all of which can do real damage to your body. HumiKleanse is a natural detoxifying supplement that helps your body rid itself of heavy metal accumulations and enhances your body's ability to utilize trace minerals. The original HumiKleanse formula came in a flavoured powder form and with a sweetening ingredient. The new HumiKleanse is encapsulated, requiring no flavour or sweetener. It all began when farmers in Hungary noticed that livestock grazing on peat moss near Lake Balaton grew up stronger and healthier than cows grazing elsewhere. Years of clinical research determined that this unique peat deposit contained humic acid, fulvic and phenolic acids, all of which help to maintain the body's natural ion balance and remove heavy metals such as cadmium, lead, and mercury. The peat moss extract, named Humifulvate®, is the key ingredient in HumiKleanse. It has a history of more than eight years of safe and beneficial use in Europe. The extract is considered unusually pure and of the highest quality, most likely because the source of peat moss is estimated to be 3,000 to 10,000 years old and free of industrial contamination. Our bodies require the presence of certain metals. Without them we could not survive. As we all know, moderation in all things is best. If found in excess in the body, these metals can be poisonous and damage may go unnoticed until it is too late. Exposure to heavy metals has been linked to developmental disability, various cancers, kidney damage, and in some instances, death. Cadmium, lead, and mercury are the three heavy metals most threatening to our health. These heavy metals are everywhere - in nature and concentrated in certain man-made products. For example, cadmium is a naturally occurring, metal that shows up in food, water, and cigarette smoke. It is also found in coal, metal coatings, plastics and batteries. Mercury is released into the air as a byproduct of many industrial processes, and it is found in fish, in many dental fillings, and in a variety of household products including thermostats, fluorescent light bulbs, and glass thermometers. Lead was once a dominant ingredient of gasoline; its residue is found all over the planet. Additionally, more than 90 percent of the homes constructed prior to 1975 contain lead-based paint. Lead is also present in hair dye, batteries, and leaded crystal. Even with a healthy diet and positive lifestyle choices, avoiding exposure to heavy metals isn't always possible because of their widespread presence in the environment. However, there is a way to acheive heavy metal detoxification and to reduce harmful levels of heavy metals in your body. Chelation (key-LAY-shun) is a process that removes heavy metals from the body. A substance is chelated when it is grabbed, trapped, and transformed by a chelating agent. The unique formulation of humic and fulvic acids in Humifulvate® created a powerful chelating agent that acts like a magnet on the large atoms of heavy metals, capturing and flushing them from the body through the normal processes of elimination. But the good news does not stop with the chelation process. Research indicates that humic acid may also act as an antioxidant. Antioxidants are integral to good health, and the more variety, the greater the protection of our cells against free radical damage, which can cause disease and accelerate aging. Before beginning a course of HumiKleanse to achieve heavy metal detoxification , AIM recommends taking a metal content test prior so you have a base number for reference. When taking HumiKleanse, metal levels will be elevated during the chelating process, so take another metal content test thirty days after using HumiKleanse. Take one capsule of HumiKleanse daily with food for a minimum of five weeks. Each capsule provides 75 mg of Humifulvate®, a plant-derived source of humic, fulvic and phenolic acids. Each bottle contains a 30-day supply. Drink ten or more glasses of pure water daily to effectively eliminate toxins. Exposure to heavy metals can be a serious health issue but AIM has armed you with a product that can help achieve heavy metal detoxification, remove them from the body as well as prevent their absorption. In doing so, HumiKleanse helps to maintain the body's immune system, aid in the retention of valuable trace minerals, and increase energy through improved oxygen transport. Prevention the AIM way remains the best medicine. The above article was reprinted with permission of AIM CanadaTM, Vancouver, British Columbia.